In the Democratic Republic of Congo, vaccines must traverse a long journey to reach health workers like Ruphin. First, they are transported from the central level to provincial storage sites, where health workers from the surrounding health centers come to retrieve them. Ruphin, a registered nurse, works in Boso-Mbuki health center which is 71 miles away from the closest storage site. In a car, the distance may not seem long, but with very limited transportation options this journey is a hard one. To get to Boso-Mbuki, you must first take a canoe to Inkanza village and from there walk down a narrow path for six hours, passing maybe one or two other people along the way. On the road, you face trees fallen over the path, deep mud, and dozens of rivers – some of which are deep and have no bridge. 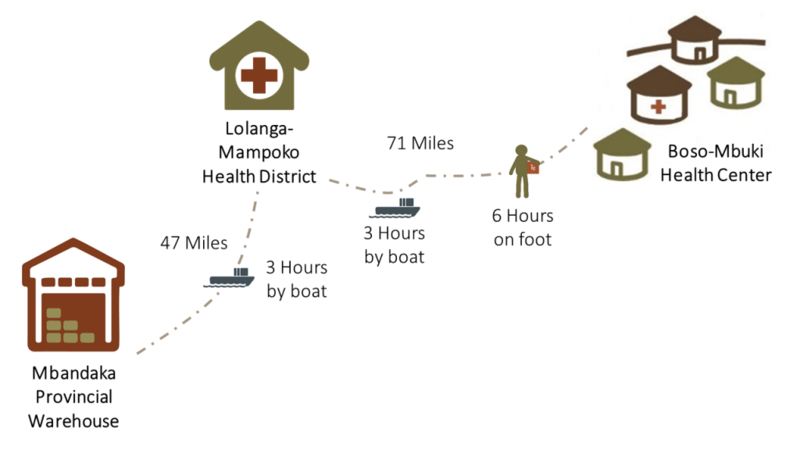 This is the path Ruphin took each month to pick up the vaccines from the health district office. In July 2017, the Ministry of Health supported by VillageReach began direct delivery of vaccines to three health zones in Equateur province. Through a program called Next Generation Supply Chain (NGCA in French) a small team from the district travels to each health center, delivering vaccines and providing on-the-job supervision and support. When the distribution team visited Ruphin at Boko-Mbuki in December 2017, data about vaccine availability and use were not properly recorded. Data from the health center inform the next cycle of delivery. Without it, it is an impossible task to get the right number of vaccines to ensure available stock for those who need it and minimal wastage. During their visit, the distribution team spent time with Ruphin reviewing data management tools and explaining the importance of the data he was collecting. In just a few short months, Ruphin lived up to this promise. On the next visit in February 2018, the distribution team saw remarkable improvement. 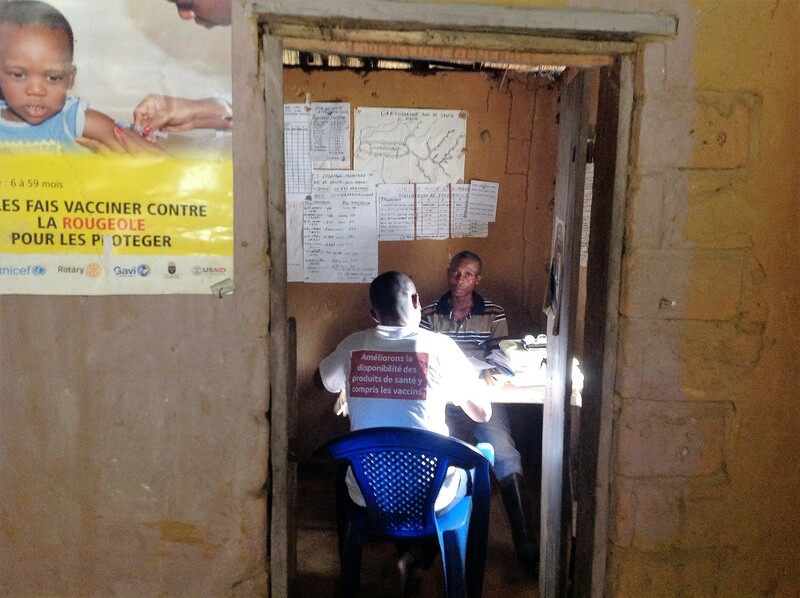 The data management forms were properly completed, all relevant data were available, and a spot check showed that the inventory data matched the number of vaccines in the refrigerator. Because of the progress Ruphin made, the distribution team can provide the right number of vaccine doses for the children of Boso-Mbuki – providing the community with the protection they need. Ruphin is just one of the many individuals doing extraordinary work around the world that make vaccines work. His dedication to improving the systems and processes at his health center create new opportunities to reach even more children with life-saving vaccines. 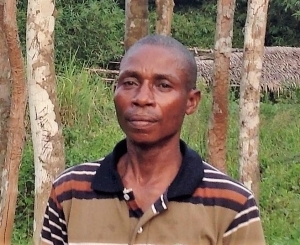 With the extra days he gets back from the direct distribution of vaccines, Ruphin is able to do more outreach work to find children unable to come to the health center. He now champions the importance of good data to make better decisions. Empowered by the dedication of Ministry of Health leadership, Ruphin and his fellow frontline health workers can deliver on the promise of immunizations in their communities – and can reach more with quality health care at the last mile.